I hope you've all had a marvellous weekend! Although I've been blogging for a long time, I don't really have much free time to read other blogs but I try to when I can. 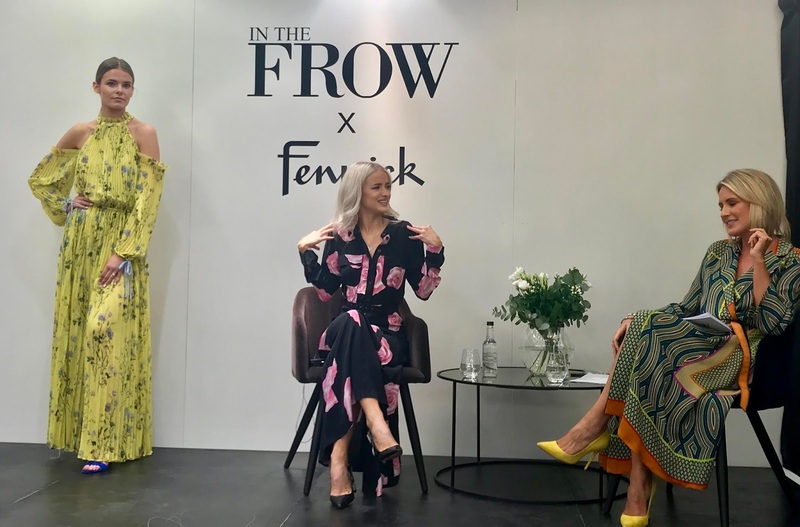 I'm a massive fan of fashion bloggers, and my three favourites that I always try to catch up on are Sofie Valkiers' Fashionata, Garance Doré's Atelier Doré and of course the wonderful Victoria Magrath's In the Frow. 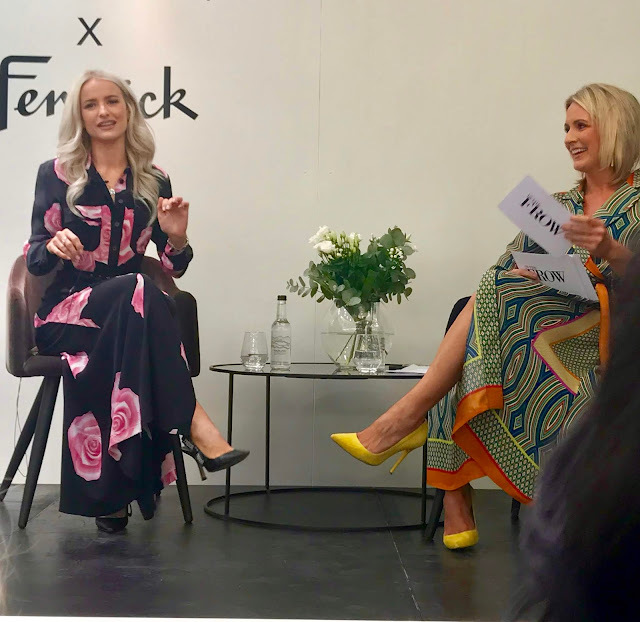 When I heard that Victoria was coming to chat fashion at Fenwick, Newcastle, I thought it would be a great opportunity to get together with my blogging bestie Krissi for a fun fashion-filled evening, with a side of Prosecco! We were greeted with a glass of Prosecco and a goodie bag, and took our seats in the glamorous French Salon to await Victoria's arrival. Interviewed by head womenswear buyer at Fenwick Newcastle, Catherine Newton, Victoria arrived wearing the most fabulous Ganni dress and Dior shoes, she looked very chic! Catherine and Victoria talked us through nine looks available at the French Salon, perfectly put together for summer events to give us ladies some fashion inspiration (I'll include links to all underneath the photos). Victoria wore a Ganni dress and Dior shoes-I'm so in love with the shoes! The first look of the evening was this beautiful Self-Portrait star mesh midi dress. Perfect for a summer wedding, this dress is simply breathtaking. The black ribbons give it more depth, so it would look equally as chic with black heels, or dressed down with a leather jacket. 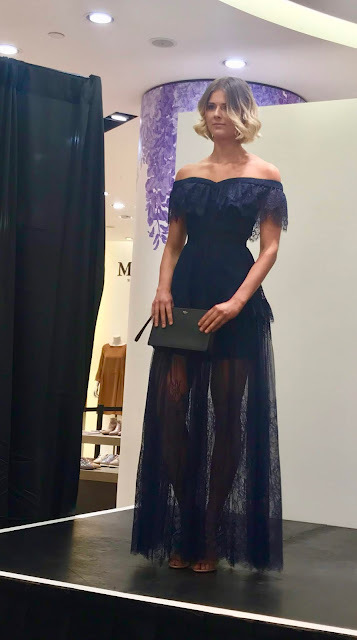 I'm planning to get married next August and have bought a non-bridal Needle and Thread dress for the occasion, but after seeing this beauty, I may need to rethink my look!! 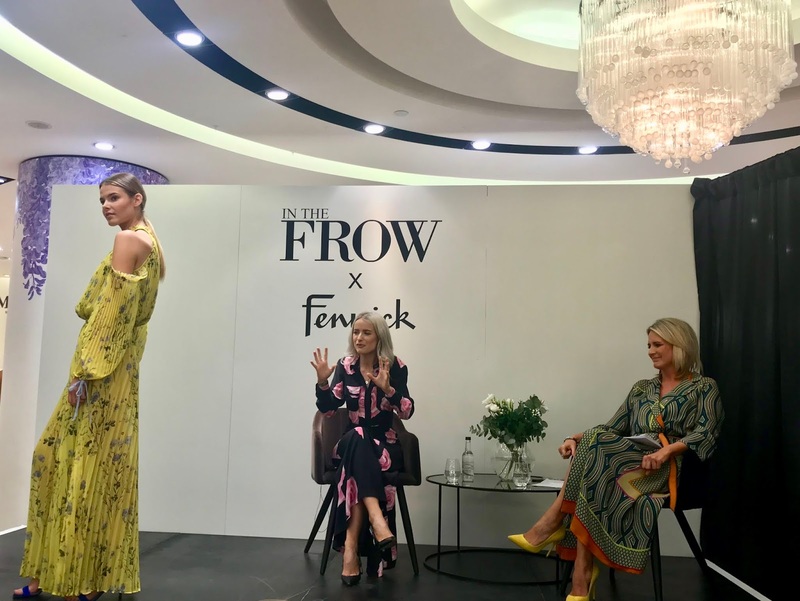 The second look came from Rixo London, and offered a lot of versatility, as accessories could be matched to any of the colours in the dress' detailing. Victoria and Catherine chose these amazing electric blue accessories, giving a fun and summery twist to the look. I loved this dress so much! Look three, was another from Self-Portrait, this beautiful mini lace V-neck. I'm a real lover of all things navy, so I absolutely adore this dress. The days of not being able to wear dark colours for summer weddings are officially over! Perfect for long, slender pins! 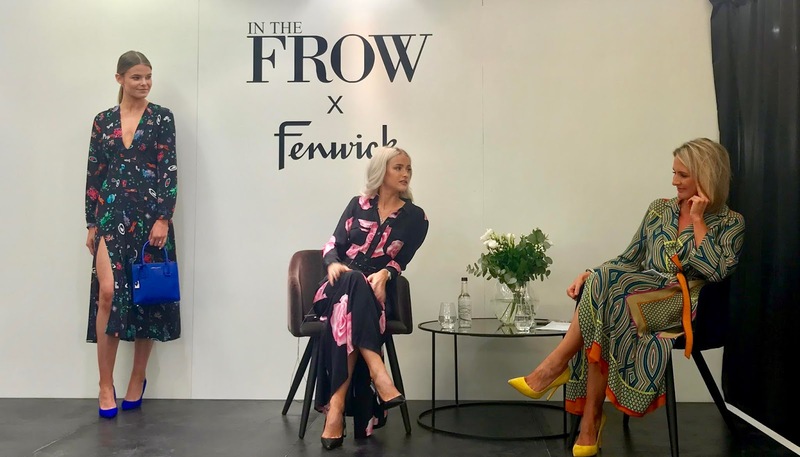 Look four was another Rixo dress, this time full of vibrant colours perfect for summer, but paired down with black accessories for a more chic look. Imagine how good this would look with a black Chanel 2.55 swinging from your arm? I'd pair with my small black Cavalli Class bag and French Connection black point-toed heels-I may have to invest! I was pleasantly surprised at how much I loved look five, as I've never really been a fan of the pyjama suit, but how chic is this? Paired with heels, it would be the ultimate in wedding comfort and is super glam! I'd pair black accessories with the black trim and wear minimal jewellery-such a statement piece! Look six certainly has the wow-factor! This beautiful orange, asymmetric drape-dress is breathtaking. It's fun, vibrant and totally summer. I could definitely see this strutting along the French Riviera and I think it would look equally amazing with some flat sandals for a more chilled summer look. Looks seven and eight, both Self-Portrait, show two contrasting styles from the brand. 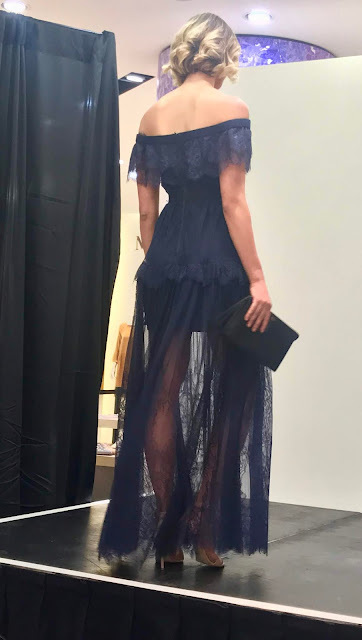 The first, the bardot-top navy maxi dress (worn by Victoria recently in Cannes) is my favourite of the two (although with my short legs I think I'd have to alter it!!). Stunning lace detailing, I think this is a perfect holiday dress which would perform equally as well in a more formal setting. The second dress looks amazing teamed with a pop of blue, and would be perfect for an English country garden party. Look nine, was one of my favourites. A piece of Burberry history from Christopher Bailey's final collection for the house-you could easily confuse this as a Victoria Beckham or Celine piece. More formal workwear than summer-wedding, I loved it's simplicity (but I am a biased Burberry lover!). 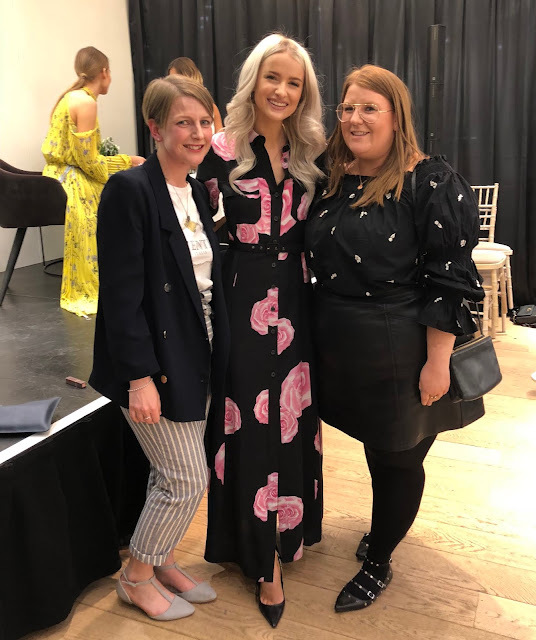 After answering some of our questions and giving some great style tips, we were invited to chat to Victoria in person and get some photographs with her. She was warm, friendly, bubbly and full of personality, just as you'd expect after watching her Youtube account. We chatted style, her gorgeous shoes, hairstyles and Cannes-it was so lovely to meet her! From someone who is just taking her first baby steps into a fashion career, Victoria truly is an inspiration! 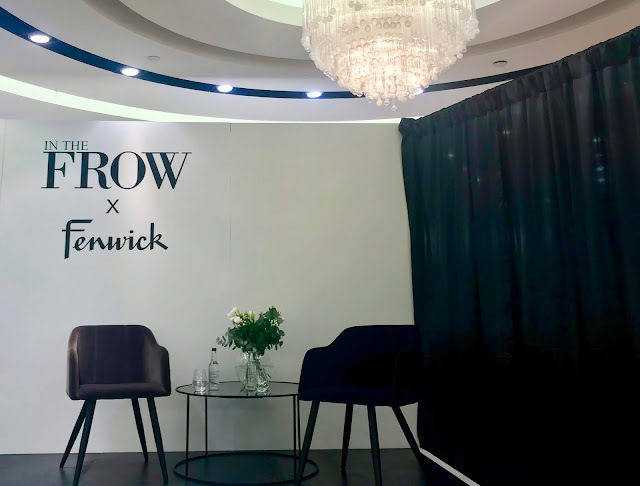 Thank you to both Fenwick Newcastle for hosting and to Victoria for being there; we had such a wonderful time!